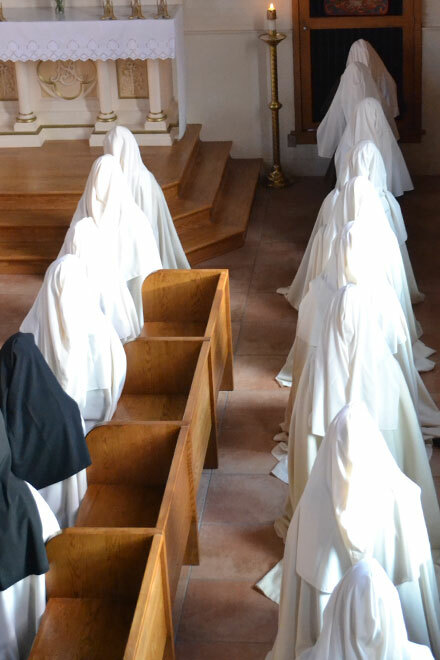 Prayerful: Carmelite nuns of the Carmel of Jesus, Mary, and Joseph at Elysburg, Pennsylvania. Photo: Fairfield Carmelites. GEORGINA Brazier hasn’t held her daughter Elizabeth in more than six years, but “a miracle” could bring the pair together later this year. The Catholic mother-of-eight from the Blue Mountains won’t hold back when her daughter, who goes by the religious name of Sr Mariam of Jesus Crucified, arrives in Australia to start a new Carmelite monastery. “We haven’t hugged her for six-and-a-half years, since she’s been in America,” Mrs Brazier said. Sr Mariam left her family behind to join the traditional Carmel of Jesus, Mary and Joseph in Pennsylvania, USA, in 2011. She is one of five religious sisters chosen to form a new community in Wilcannia-Forbes diocese at the invitation of Bishop Columba-Macbeth Green. The community is a papally enclosed, monastic Discalced Carmelite community that can be traced back to a 16th century Spanish Carmelite monastery founded by St Teresa of Avila. The community uses the Extraordinary Form of the Mass and Divine Office, chanting prayers in both Latin and Spanish, and follow the Rule and Constitutions dating back to Mount Carmel in the Holy Land. The order has communities in the United States and Mexico and expressed a desire to found a monastery in Australia at the invitation of a bishop. It will be the first time a Carmelite community has lived in Wilcannia-Forbes diocese since 1987, when the Carmel of Tourcoing from France, who established in Parkes in 1949, merged into a new community in Varroville, 50km south-west of Sydney. Bishop Macbeth-Green said he invited the Carmelites to the diocese because he believed all dioceses should have the presence of contemplatives. “Obviously the prayer and the witness is unbelievable,” Bishop Macbeth-Green told The Catholic Leader. No stranger to monastic orders, the former Pauline Father and Wilcannia-Forbes native grew up knowing the Carmelites in Parkes. “Obviously the bishops before me thought it was a very good idea in having one,” he said. Bishop Macbeth-Green said the Carmelites would offer significant spiritual support to the priests of his diocese, one of the largest but poorest in Australia. “The fact is Carmelite spirituality, especially from St Therese of Lisieux, is geared towards supporting priests, especially in the missions,” he said. “Some of our priests are working in very challenging areas; there is isolation and difficulties out there. A Carmelite Sister explores the field in their Pennsylvania monastery. The Sisters are searching for a plot of land in Wilcannia-Forbes diocese where they intend to start their first Australian monastery. Photo: Fairfield Carmelites. Following the invitation from Bishop Macbeth-Green about two years ago, an organising committee in Australia, which includes Mrs Brazier, received the appropriate ecclesiastical approval from the Holy See and has sought the necessary legal entities to establish the community under Australian jurisdiction. The Carmelites would need to be self-funded to live in the diocese, and a fundraiser has already been established on behalf of the sisters. The hope is to raise $850,000 to buy at least 80 hectares of land in the southern area of Wilcannia-Forbes diocese. The sisters have agreed to move into “an ordinary farm house” before possibly expanding their monastery. Mrs Brazier said within two days of formally announcing in early April the community’s intention to start a monastery in Australia, the committee received $5000 in donations. The excited mum said “it will take a miracle” to bring the five sisters to Australia by the end of the year. The Carmelite Sisters of Jesus, Mary and Joseph in prayer inside the chapel of the Fairfield monastery. Photo: Fairfield Carmelites. Sr Mariam’s sister, mother-of-four with one of the way Jean Haynes, “presumed it would be impossible” for her sister to be part of the new Australian community as younger community members did not normally help establish new monasteries. However, the Carmel’s mother superior gave permission for the only two Australians in the community, who both joined in the United States, to be part of the new Australian monastery. Mrs Haynes, who lives in Wilcannia-Forbes, said it was important for her to raise her children in a diocese that valued and embraced contemplative life. “For me, I want my kids to know what their Catholic heritage is and to see that which is the history of the Church in contemplative life,” she said. Mrs Haynes said her family including her children were “well versed in tapping into that powerhouse” that was the Carmelites, often sending prayer intentions to her own sister in emails or letters. She praised Bishop Macbeth-Green’s support and desire to have a Carmelite monastery in his diocese. “Bishop Columba has been awesome in providing us with such a level of support,” Mrs Haynes said. 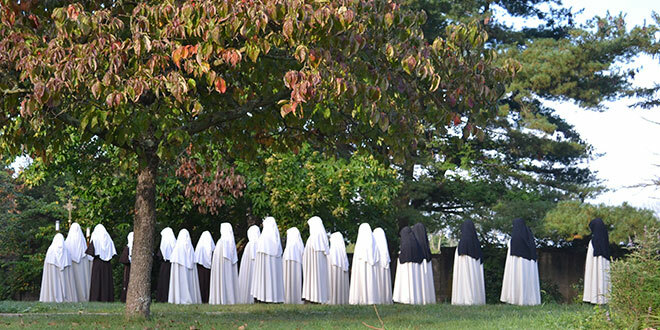 New community: Members of the Notre Dame Priory in Tasmania. Photo: Mishka Gora. The new Carmelite monastery looking to establish in Australia will be the second community that follows traditional aspects of monastic life. On February 22, 2017, Hobart Archbishop Julian Porteous welcomed the Notre Dame Priory nearly 15 years after an Australian couple travelled to France to find a new group of monks for Australia. The community’s prior, American-born Benedictine Father Pius Mary Noonan, was chosen to establish the new monastery following several years of leading retreats in Australia, including in Brisbane. 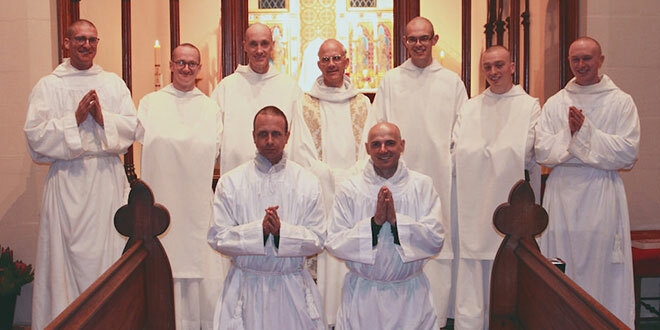 The monastery has survived its first 14 months, receiving four vocations from Queensland and recently welcoming a new monk, Australian priest Fr Mark Withoos, who took on the name Brother Augustine Mary on April 10. The Notre Dame Priory follows the traditional Rule of St Benedict, living a life of prayer and labour – ora at labora – praying the Divine Office eight times a day and participating in the Holy Mass daily. The monks take on a vow of stability, conversion of life, poverty, chastity and obedience, and lead silent and guided retreats based on the Spiritual Exercises of St Ignatius of Loyola. In an April 19 meeting with members of Benedictine communities in Rome, Pope Francis said the order offered quiet and prayer amidst a rushed world. “In this age, when people are so busy that they do not have enough time to listen to God’s voice, your monasteries and convents become like oases, where men and women of all ages, backgrounds, cultures and religions can discover the beauty of silence,” Pope Francis said.